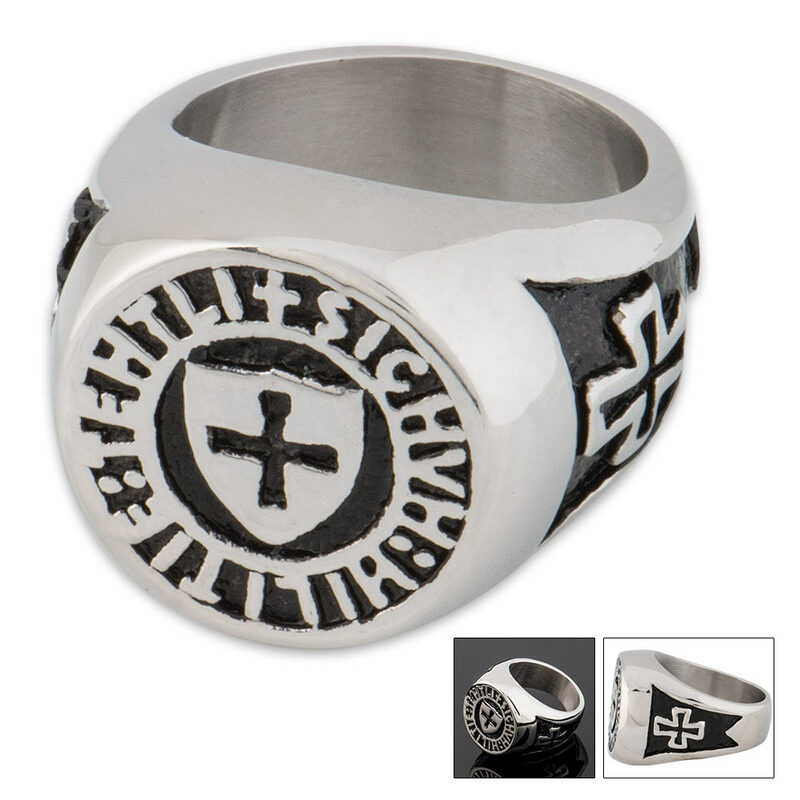 Wear this shield of Christian faith and know that you are wearing an eye-catching piece of jewelry on your finger. The intricately carved details are what really make this ring stand out as an elegant tribute to the Christian faith. It is crafted of stainless steel so it is definitely rust-resistant. The design has as its centerpiece a cross inside of a shield set within a circle. 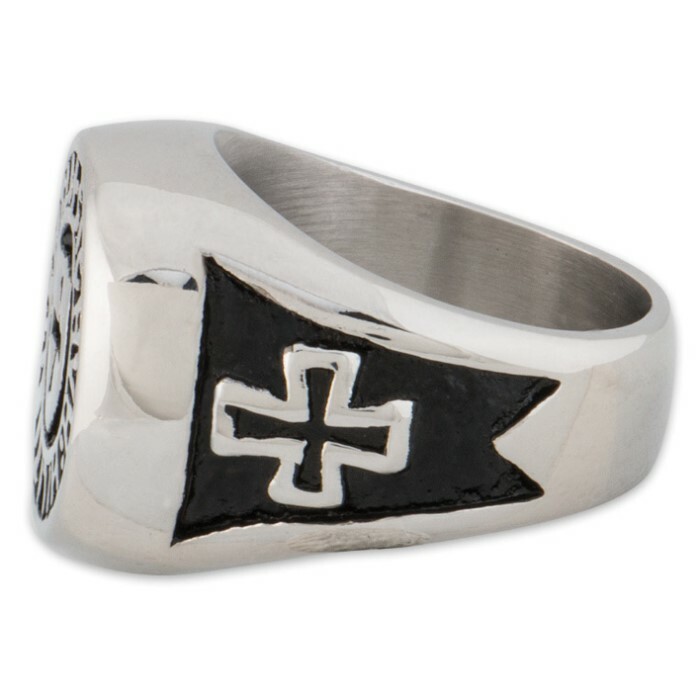 The design is continued on the sides of the ring with a cross set on a black background. It comes in sizes 8, 9, 10, and 11. First I want to say this is a very solid, well constructed ring, nice and heavy and the back is not hollowed out. Where it fails is in the seal itself. It's a Knight's Templar seal (actually, it combines a couple different periods) and the wording is supposed to be SIGILLIM MILITUM XPISTI (Seal of the Soldiers of Christ). I guess the maker couldn't be bothered to do some research because what they have on the ring is gibberish (SICHVH HILITIE TEHTLI). Even if you give them the CHV as GMU it's still jibber jabber. I think I'm going to have that drilled out and filled with gold. 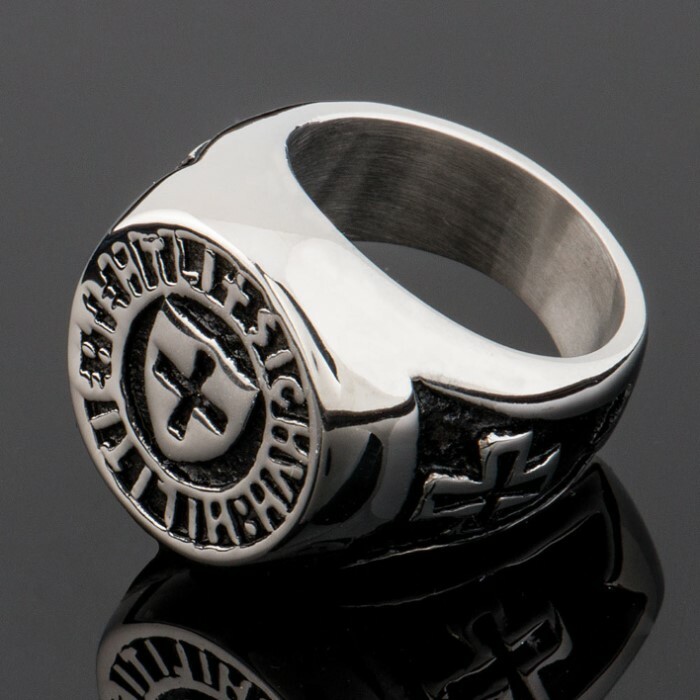 Or maybe silver and then have it engraved correctly (maybe IN HOC SIGNO VINCES or DEUS VULT). The sizing is very good - I wear a 10.5 and ordered an 11 and the ring is just slightly too big. Anyway, this is a 5 star quality ring with 2 stars subtracted for sloppy research, I like it okay but I don't love it. The words surrounding the sheild are Mind ,heart,deeds,from Jerimiah 17:10 "I the Lord search the heart and examine the mind to reward each person according to what his ways and deeds deserve."